Singaporeans won’t have to wait long to get their hands on the new iPad Air, announced just last night at Apple Headquarters in Cupertino. 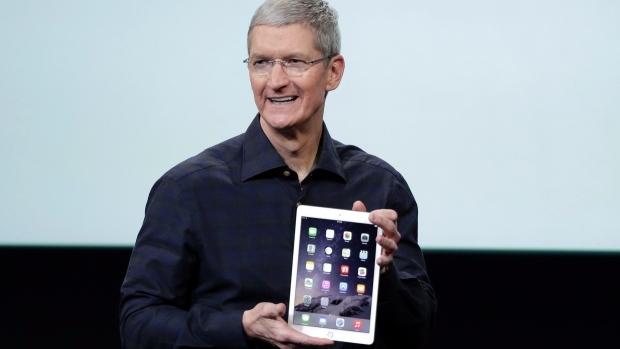 The iPad Air 2 is the latest member of Apple’s range of tablets, which according to Apple CEO Tim Cook is the most popular Apple product ever. The tablet is reportedly the thinnest tablet in Apple’s repertoire, with 240 mm in height, 169.5 mm in width, 6.1 mm in height, and approximately 0.44kg in weight (437 g for WiFi, while the WiFi and Cellular capability option weighs 444 g). It’s thin-ness also beat that of its main competitors, mainly the Samsung Galaxy Tab S 10.5 at 6.6mm and the Sony Xperia Z2 tablets at 6.4mm. 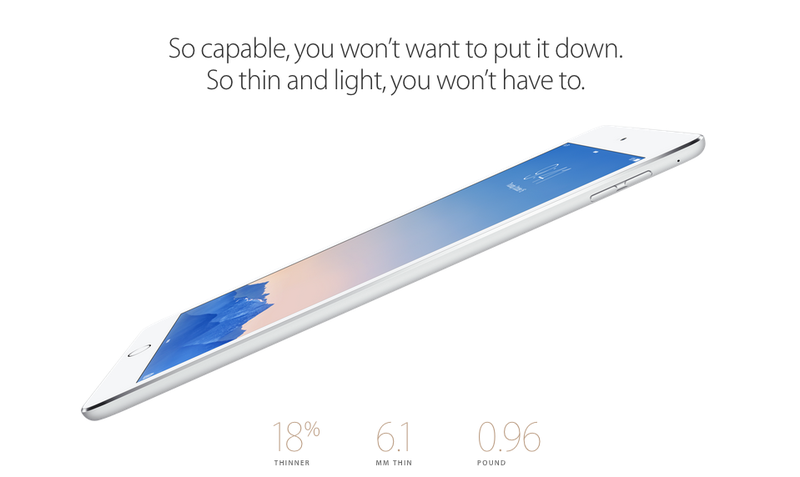 Aside from being thinner and lighter than its predecessors, there are also some improvements. It has a A8X processor that makes the iPad faster and a M8 motion co-processor that was first introduced in the iPhone 6, which gathers motion data from the accelerometer, gyroscope, compass and an all-new barometer. It also supports Metal, Apple’s newest graphics technology in iOS 8, with realistic visual effects that Apple boasts will put “console-level graphics in the palm of your hands”. There is also a brand new iSight camera with 8-megapixels (an improvement from the previous 5 megapixels) that supports time-lapse, slo-mo videos, 46 megapixels panoramic shots, and burst-mode. The iPad Air 2 also finally has a Touch ID fingerprint sensor built in, something that has been available since the launch of the iPhone 5S last year. This will add not only an extra layer of security to your iPad, but will support online payments in the iTunes store as well as ApplePay when it launches. The display remains the same, with its 2,048-by-1,536 resolution screen, but now has an anti-reflective coating that reduces reflections by 56% and a fingerprint-resistant oleophobic coating. It claims to be able to support faster internet surfing with 20 LTE bands, which Apple claims to be more than any other tablets in the market. Customers will have a choice between the 16GB storage option, 64GB, or 128GB, and can choose between simply having the Wi-Fi capability or the Wi-Fi and Cellular capabilities. Apple also released the iPad Mini 3, which sports similar specs to the iPad Mini 2, other than the new Touch ID fingerprint sensor. Both iPad Air 2 and iPad mini 3 will be available in gold, space grey, and silver. The iPad Air 2 will retail next week locally at a starting price of $688 for Wi-Fi models and $868 for Wi-Fi + 4G models. The iPad mini 3 will also be available with a starting price of $548 for Wi-Fi models and $728 for Wi-Fi + 4G models. StarHub has already announced that it will be offering the iPad Air 2 with Wi-Fi + Cellular and iPad mini 3 with Wi-Fi + Cellular later in October. They will have a range of attractive data plans that will allow customers to connect to its ultra-fast 4G LTE-Advanced network. Details on pricing and availability will be made available soon. M1 has also released a statement saying that it too will offer the iPad Air 2 with Wi-Fi + Cellular and iPad mini 3 with Wi-Fi + Cellular later in October, with range of data plans that will allow customers to connect to its ultrafast nationwide 4G network with speeds up to 150Mbps.